In recent years, many states have adopted rules and regulations for distance education programs and courses offered by out-of-state institutions. TN eCampus provides access to high-quality, student-centered distance education through a partnership of Tennessee universities, community colleges and colleges of applied technology. Through this partnership, TN eCampus supports the efforts of our partner institutions to comply with the rules and regulations of each state. The National Council-State Authorization Reciprocity Agreement (NC-SARA) is an agreement among member states that “established comparable national standards for interstate offering of postsecondary distance education courses and programs.” Refer to the link at: http://nc-sara.org/state-actions/state-actions-regarding-sara to verify State Actions Regarding SARA. SARA pertains to educational programs and courses only and does not have any effect on state professional licensing requirements. Note: Effective June 2015, the state of Tennessee was approved by the Southern Regional Education (SREB) to join the State Authorization Reciprocity Agreement (SARA). Programs delivered through TN eCampus that require clinicals, internships, field experiences, etc. and lead to professional licensure must also abide by state and board regulations in the state where the student resides. Students who wish to complete any experience in a state other than Tennessee, may need to take additional steps to comply with the requirements of that state before starting a program through the TN eCampus consortium. We strongly advise ALL current and prospective students to become familiar with their state’s regulations and professional licensing requirements by seeking information, and/or approval with their state boards where they reside or have plans to reside as a practitioner. Students may be allowed to participate in clinical experiences if their professional licensing boards (Nursing, Teaching and Psychology) do not regulate out-of-state programs. However, additional requirements may apply to students who will become practitioners in their state upon program completion. Links to state agencies and professional licensure boards can be found under Authorization Disclosures by State. 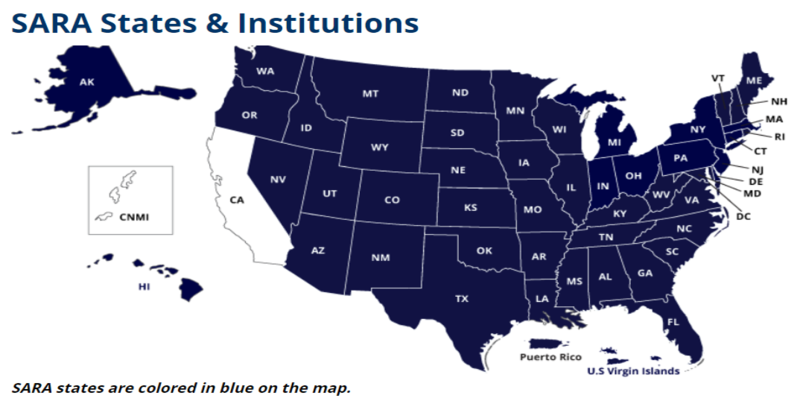 States that have joined SARA are shown on the map below and appear in dark blue. News and updates regarding SARA can be found here. Note: applies to the MSN and Post Master's Certificate programs and courses offered through TN eCampus only. *Information is subject to change. Questions about requirements should be addressed to the relevant state board of nursing for guidance. Students are allowed to complete clinical course work towards their nurse practitioner certificate in Alaska. The student must apply for a preceptorship permit under regulation 12 AAC 44.460. The permit requires documentation of a preceptorship arrangement signed by the student and the preceptor and/or organization providing the clinical site. Transcripts must be submitted indicating completion of basic courses in preparation for clinical practice. to fulfill the requirements for reinstatement of a lapsed advanced nurse practitioner authorization under 12 AAC 44.475. (1) “accredited” means approved by the Commission on Collegiate Nursing Education (CCNE), the Accrediting Commission for Education in Nursing (ACEN), or another national nursing accrediting organization at the time the applicant attended the program. The Arizona State Board of Nursing (Board) has jurisdiction over nursing programs that either lead to licensure as a registered/practical nurse or lead to certification in advanced practice nursing. The Board does not have jurisdiction over RN to BSN programs, generic master’s programs not leading to advanced practice certification and generic doctoral programs not leading to advanced practice certification. The Board also has jurisdiction over refresher programs. Generally pre-licensure programs must be approved by the Arizona Board to offer clinical sessions in Arizona; advanced practice programs must be approved by the nursing regulatory body in the state of origin and students and faculty participating in clinical training in Arizona must be licensed or privileged to practice registered nursing in Arizona. On September 22, 2011 the Board adopted a motion to allow nurse practitioner and clinical nurse specialist students to engage in clinical education in Arizona under ARS 32-1631 if the program they are attending is approved for the purpose of certification or licensure of program graduates in the jurisdiction of the program and the student meets all other requirements. According to Arizona statutes, advanced practice (RNP, CNS, CNM and CRNA) students may participate in clinical learning in Arizona as long as they have a valid Arizona RN license or multi-state privilege and their program is approved by the nursing regulatory body in the state of origin. Faculty teaching from remote locations to students in AZ must also have a multi-state or AZ license unless exempt as specified below. On September 22, 2011, the Board voted to allow nurse practitioner and clinical nurse specialist students to engage in clinical education in Arizona under ARS 32-1631 if the program they are attending is approved for the purpose of certification or licensure of program graduates in the jurisdiction of the program and the student meets all other requirements. Please note that teaching is considered the practice of nursing in Arizona and any faculty member teaching nursing courses to students in Arizona, whether online or on-ground, must hold an Arizona license or multi-state compact license unless exempt under A.R.S. § 32-1631 (8). The Arkansas Board of Nursing has the statutory authority to require licensure for faculty teaching online didactic programs to Arkansas nurses. At this time, the Arkansas Board of Nursing is not enforcing licensure for faculty teaching the didactic portion of an online program, but it is subject to change. The Arkansas Board of Nursing does approve online programs, but institutions need to either be a SARA school or certified by the Arkansas Department of Higher Education. California is not a SARA approved state. The State Board of Nursing in Colorado does not have jurisdiction over post licensure nursing education programs. The State of Colorado does have a Workers Compensation requirement for students engaged in clinical practicum experiences. The educational institution is expected to work the coverage out with the clinical institution. The Office of Higher Education does not approve/regulate clinical placements, externships or internships. The Georgia Board of Nursing does not approve post licensure programs. Post licensure programs must be accredited by a national nursing accrediting body. All students in Georgia enrolled in a post licensure program must be duly licensed by the Georgia Board of Nursing. Additionally, any faculty or preceptors teaching or working in Georgia must be duly licensed by the Georgia Board of Nursing. Additional approvals for some licensed occupations’ field experiences may be necessary. The State of Illinois Department of Professional Regulation does not regulate or give approval for these types of programs. See Illinois Center for Nursing website for more information on post-licensure programs. The Indiana State Board of Nursing has no jurisdiction over post licensure nursing education programs. If the distance learning student intends to engage in a clinical experience in Indiana, the student must have a free and unencumbered Indiana nursing license. In addition, all faculty or preceptors engaged in a learning activity, who are physically present in the state of Indiana, must meet the same requirements. The Board of Nursing reviews the curriculum of each program to determine if it requires a minimum of 3 semester credit hours each of Advanced Pharmacology, Advanced Health Assessment, and Advanced Pathophysiology; a minimum of 500 clinical hours, and accreditation by a national nurse credentialing commission. For clinical experiences in Kansas, the mentor/preceptor should be given an orientation program and enter into an agreement to participate as a mentor. They should also be licensed as a Kansas advanced practice nurse in the role that your student is studying. The regulation regarding this is located online at ksbn.org, link to the Nurse Practice Act, at KAR 60-17-104. Faculty do not need to be Kansas licensed if they are teaching online programs that Kansas students are taking. If the faculty who are involved in evaluation and advisement of NP students are advising them as to their conduct and performance of school requirements, that is fine. However, they would not be able to advise about practicing as a nurse in Kansas, unless they were licensed in Kansas. The status of students while in Kansas clinical settings would be that of (Kansas) licensed RNs, acting as students of Advanced Practice Nursing, under the umbrella of KSA 65-1124. They would be responsible to their mentor/preceptor for supervision and delegation as well as that of the Kansas nurse who was actually caring for the patient. Clinical supervision of students or preceptors would require a Kansas license. There is no Kansas requirement for the school faculty to visit the student during a clinical, however if they did they would be in the status of visitor as would any lay person. The nurse student and preceptor would, of course, need the permission and cooperation of the particular facility they are in for the student and preceptor to conduct the training. The facility should meet the requirement of clinical resources in KAR 60-17-106, available online at ksbn.org, click on the Nurse Practice Act. Nursing faculty who oversee students in the clinical setting/serve as preceptors in Kentucky for an online MSN/DNP APRN program, must possess an unencumbered active Kentucky RN license. Nurse faculty who teach didactic information via distance or online and who do not physically practice within the state must hold an unencumbered active nursing license to practice as a registered nurse in the nurse faculty's primary state of residence. Clinical faculty members who do not reside in a compact state will need to possess unencumbered active RN & APRN Kentucky license(s). If the clinical faculty member resides in a compact state, the APRN clinical faculty member would require a KY APRN license to oversee students in Kentucky without seeking a separate Kentucky registered nurse license. Faculty members who are not participating in clinical activities are not required to possess a Kentucky nursing license, provided that the faculty member holds an unencumbered active nursing license in his/her home state/primary state of residence. See Using Kentucky Clinical Sites for additional information. The Kentucky Board of Nursing currently does not have any jurisdiction over out-of-state programs. As a result, a university is not required to submit any information to the Board (e.g., student rosters, faculty lists, field experience locations). Approval of programs is required for any clinical experiences in the state that lead to licensure as an RN or an APRN (initial and additional roles/populations). According to the rules and regulations, programs wishing to establish a program in Louisiana must show evidence of correspondence with approved Louisiana based programs secured for a 100 mile radius from the campus and programs desiring to offer clinical experiences must show evidence of correspondence with Louisiana Schools. Programs seeking to establish an undergraduate or graduate program must seek approval from the same level programs within 100 miles of the intended campus location. Out-of-state undergraduate and/or graduate programs desiring to be approved for distance education are required to contact ALL Louisiana based programs on the approval list. LSBN will provide you with a form for distribution to those Schools of Nursing that may be impacted by your program. Please gather those responses and submit with your proposal to the Louisiana State Board of Nursing. To obtain a copy of the form, please contact us and we will email you a copy. Once the proposal has been reviewed by the Director of Edu/Lic, it will be presented to the Board at one of its scheduled meeting. MOST IMPORTANTLY, you must have faculty that are licensed in the state of LOUISIANA. Before you submit your proposal, make sure that your faculty have Louisiana RN licensure or have been ENDORSED in LOUISIANA. You may access the information concerning endorsement on our website as well. Also, make sure that the faculty’s area of clinical specialization is equivalent to the concentration/specialty area that is offered by your institution. For each area of concentration, you will need a faculty member who is licensed in Louisiana with that area of specialization. Maine only approves pre-licensure programs for RNs and LPNs. Massachusetts is not a SARA approved state. The Michigan Board of Nursing does not regulate any advanced practice, post-RN licensure educational programs. In Minnesota, all postsecondary education programs (including online programs) must be registered with the Minnesota Office of Higher Education. This is not a Board of Nursing requirement, but is related to other state statutes. The process for licensure by endorsement for a professional nursing license is straightforward; Forms and information about the licensure process can be found here. In May 2014, the legislature passed a new statute that included licensure for advanced practice registered nursing. Clinical faculty of record teaching Minnesota students in an advanced practice nursing program must obtain this license as well as a license to practice as a registered nurse in Minnesota. APRN licensure materials are available here. Per the Office of Higher Education, SARA state members and SARA institutions, can conduct distance education to serve Minnesota students. Effective January 1, 2015, no advanced practice nurse shall practice as an advanced practice registered nurse unless the advanced practice nurse is licensed by the board under this section. An applicant for a license to practice as an advanced practice registered nurse (APRN) shall apply to the board in a format prescribed by the board and pay a fee in an amount determined under section 148.243. Must not have committed any acts or omissions which are grounds for disciplinary action in another jurisdiction or, if these acts have been committed and would be grounds for disciplinary action as set forth in section 148.261, the board has found, after investigation, that sufficient restitution has been made. Students attending an out-of-state university can be licensed in Mississippi as long as they are able to sit for their national certification boards. The Missouri State Board of Nursing does not have jurisdiction over graduate nursing programs. The student must have an RN license in Missouri or a multi-state license from another compact state. To be eligible for recognition as an APRN in Missouri, the APRN must complete a graduate degree from an accredited college or university with a concentration in an advanced practice nursing clinical specialty area, which includes advanced nursing theory and clinical nursing practice. From and after January 1, 2009, the program shall provide a minimum of five hundred (500) faculty supervised clinical hours. Any faculty working with the student, whether in Missouri or not, must be licensed in Missouri. Further clarification about faculty: Practice is where the patient/student is. Faculty, whether clinical or didactic, must be licensed in MO or hold a multi-state license from another compact state. If the faculty is reviewing/providing education that is specific to the care being provided to patients in Missouri, the faculty would need to be recognized as an APRN in Missouri. Compact State Requirements: Tennessee and Missouri are both Nurse Licensure Compact (NLC) states. When moving from one compact state to another, a nurse can practice on the former residency license for up to 30 or 90 days (states are individually implementing the 90-day rule-- from NCSBN). Nurses are required to apply for licensure by endorsement. It is recommended that nurses apply 1-2 months in advance of practicing in a new state. The practicing nurse (faculty) would have to pay any applicable fees and complete a declaration of primary state of residency in Missouri (NCSBN, n.d.). The faculty will then be issued a new multi-state license and the former is inactivated (NCSBN, n.d.). The fee to apply for an APRN license in Missouri is $150. (State of Missouri advanced practice registered nurse application instructions, 2015). In order to offer online education in Nevada, your institution must possess a CPE license. You can check with your institution to see if you have one. As long as your nurses have a Nevada RN license and their preceptor has the proper licenses, the NSBN does not regulate post-licensure programs. We do not oversee graduate programs. You should, however, notify the board office if students are doing clinicals in the state. New Mexico Board of Nursing has jurisdiction on nursing practice and pre-licensure (RN and LPN) education programs, but does not have jurisdiction of post-licensure education programs. The New Mexico Department of Higher Education has jurisdiction for the licensing of all college and graduate programs that operate in New Mexico. If your school has a presence in New Mexico, the school must be licensed in New Mexico which by regulation, is defined as offering courses, programs or degrees on site or from a geographical site in New Mexico or maintaining an administrative, corporate or other address in the state.” [5.100.2.7.L] NMAC 1978 63-3-.9-I. Contact the New Mexico Department of Higher Education, if you are unclear about your school’s licensure status or have additional questions. If there is a clinical component to the program you plan to meet in North Carolina, the program needs to have approval. Students: See the following information on the North Carolina Board of Nursing website: What is NP Registration? and What is Initial Approval to Practice? If you meet these requirements, you are eligible to apply for NP registration and approval to practice as a NP in North Carolina. Institutions: Out-of-state programs are approved by the Board of Nursing in the state in which they reside. Please see 21 NCAC 36.0223 regarding the education program rules. Clinical Experiences: If there is a clinical component to the program that you plan to meet in North Carolina, the program must have approval from the University of North Carolina General Administration. Contact ncsaa@northcarolina.edu for more information on approved programs. This is a mandate from the United States Department of Education and is not associated with the North Carolina Board of Nursing. Programs that the North Carolina Board of Nursing does not have jurisdiction over include RN-BSN programs, masters and doctoral programs. Clinical site rotations beyond the pre-licensure level are within the purview of the academic institution. The North Dakota Board of Nursing (NDBON) does NOT have jurisdiction over programs that are post-licensure (ex. RNBSN). In the case of an APRN seeking a post-masters certificate, this would be considered post-licensure, and as such the NDBON has no jurisdiction over that program either. The North Dakota State Board of Higher Education requires that all degree-granting post-secondary institutions offering on-site or distance education to North Dakota students must seek authorization or exemption. Nursing programs fall under exemption, although there is still a fee associated with exemption. North Dakota is an approved SARA state. If a state has chosen to participate in the National Council SARA (State Authorization Reciprocity Agreements) there is no need to provide proof of State Board of Higher Education exemption. The Ohio Board of Nursing does not regulate post-licensure nursing education programs. A nurse practitioner student would be practicing under the "exemption from licensure" found in Ohio Revised Code 4723.32(F) (assuming the NP student meets all of the requirements stated there). With respect to Education programs, the Board enforces law and rules regulating pre-licensure education programs but does not regulate post-licensure programs such as MSN programs. If you have further questions after reviewing this response to: Education and Practice Unit, at: practice@nursing.ohio.gov - 4723.32 Exemptions. The student acts under the supervision of a registered nurse serving for the program as a faculty member or teaching assistant. The student acts under the supervision of a registered nurse serving for the program as a faculty member, teaching assistant, or preceptor. The Nurse Practice Act and the administrative rules adopted thereunder are available for review on the Board's website: www.nursing.ohio.gov in the "law and rule" section. The advanced practice registered nursing education program meets the requirements established by the Oklahoma Board of Nursing for education preparation of Advanced Practice Registered Nurses. Current requirements for educational preparation of Advanced Practice Registered Nurses include graduation from an advanced practice role and specialty recognized by the Oklahoma Board of Nursing. The list of APRN national certifications approved by the Board of Nursing may be accessed at http://nursing.ok.gov/prac-natlcert.pdf . Clinical preceptors will serve as a role model and educator to the student. Clinical preceptors may be used to enhance faculty-directed clinical learning experiences, but not to replace them. "Qualified preceptor" means an Advanced Practice Registered Nurse with a current unrestricted license who has a scope of practice which includes prescribing and has met the requirements for prescriptive authority; or a licensed practitioner of medicine or osteopathy with unrestricted prescriptive authority. The State Board of Nursing regulates pre-licensure and certified registered nurse practitioner programs located in the Commonwealth of Pennsylvania. Although the Board does not regulate nursing education programs located outside the Commonwealth or approve clinical preceptorships for students enrolled in these programs, the Board directs your attention to the attached information regarding faculty, students and clinical preceptors. Links to the RN Law and the Board’s regulations are available on the Board’s website at http://www.dos.pa.gov/nurse by clicking on “Board Laws and Regulations.” Questions regarding the application, interpretation or impact of these provisions, as well as any ancillary laws or regulations, should be directed to your entity’s legal counsel. Refer to the Nurse Practice Act Chapter 33 Section 40-33-30(A, B) Licensing Requirement for information. Resource information and a list of Nurse Licensure Compact states can be found at http://www.ncsbn.org/. Nurse Licensure Compact laws can be found in Article 15 of the SC Nurse Practice Act and in Regulations-Chapter 91 Article 1. Both of these documents can be found under Laws/Policies on the website. For further questions on APRN education, regulation, or licensure requirements, contact: Linda.young@state.sd.us or view the Frequently Asked Questions document. The Texas Board of Nursing does not have jurisdiction over graduate nursing programs or students. Students enrolled in out-of-state graduate nursing programs and carrying out clinical learning experiences in Texas would need to have a current, unencumbered license in Texas. Their preceptors also should possess a current Texas license. If any faculty from the program visit the state to supervise clinicals or evaluate students, they would also need to be licensed in Texas. Utah requires approval of all nursing education programs in which students complete a clinical component in Utah, regardless of student’s licensure status in Utah, and NOT exclusive to students with direct patient care. Has faculty who are employed by the nursing education program, who meet the requirements established by the accrediting body and by the Tennessee Board of Nursing to be a faculty member, who is licensed in Utah or a compact state if supervising face-to-face clinical or practica experiences, and are affiliated with an IHE. Submits an annual report to the Utah Board of Nursing by August 1 of each year including number of students placed in Utah facilities, an attestation that all face-to-face clinical faculty and preceptors used by the program are licensed in Utah or a compact state, and verification that the program is in good standing with its accrediting body. Virginia State Council of Higher Education (links to external website). View Virginia's Distance Education Policy here. To be eligible for licensure in Virginia as an advanced practice nurse, the person would need to have graduated from an approved masters program in whatever state they are in and pass the certification exam for their specialty area." The following TN eCampus partner institutions are approved within the State Authorization Reciprocity Agreement (SARA) to offer distance education programs and courses to students who reside in states that have joined SARA. Please note professional licensure board approval for programs leading to state licensing are NOT covered under SARA.